Suddenly a voice came to him, and said, "What are you doing here, Elijah?" And he said, "I have been very zealous for the LORD God of hosts; because the children of Israel have forsaken Your covenant, torn down Your altars, and killed Your prophets with the sword. I alone am left; and they seek to take my life." Then the LORD said to him: "Go, return on your way to the Wilderness of Damascus; and when you arrive, anoint Hazael as king over Syria. Also you shall anoint Jehu the son of Nimshi as king over Israel. And Elisha the son of Shaphat of Abel Meholah you shall anoint as prophet in your place." And Jesus came and spoke to them, saying, "All authority has been given to Me in heaven and on earth. "Go therefore and make disciples of all the nations, baptizing them in the name of the Father and of the Son and of the Holy Spirit, "teaching them to observe all things that I have commanded you; and lo, I am with you always, even to the end of the age." Amen. 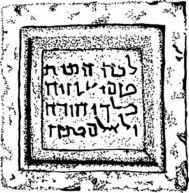 In a Russian Orthodox monastery located on the Mount of Olives, an inscription was discovered bearing the name of King Uzziah. The inscription reads: "To this place, the remains of Uzziah, King of Judah, were placed. Do not disturb"
Another inscription, from the Assyrian king Tiglath-Pileser, mentions "Azariah (Uzziah) of Judah" multiple times. 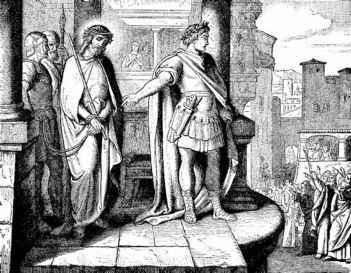 Uzziah was sixteen years old when he became king, and he reigned fifty-two years in Jerusalem . . . He sought God in the days of Zechariah, who had understanding in the visions of God; and as long as he sought the LORD, God made him prosper . . .
And he made devices in Jerusalem, invented by skillful men, to be on the towers and the corners, to shoot arrows and large stones. So his fame spread far and wide, for he was marvelously helped till he became strong. But when he was strong his heart was lifted up, to his destruction, for he transgressed against the LORD his God by entering the temple of the LORD to burn incense on the altar of incense. So Azariah the priest went in after him, and with him were eighty priests of the LORD; valiant men. And they withstood King Uzziah, and said to him, "It is not for you, Uzziah, to burn incense to the LORD, but for the priests, the sons of Aaron, who are consecrated to burn incense. Get out of the sanctuary, for you have trespassed! You shall have no honor from the LORD God." King Uzziah was a leper until the day of his death. He dwelt in an isolated house, because he was a leper; for he was cut off from the house of the LORD. Then Jotham his son was over the king's house, judging the people of the land. Now the rest of the acts of Uzziah, from first to last, the prophet Isaiah the son of Amoz wrote. So Uzziah rested with his fathers, and they buried him with his fathers in the field of burial which belonged to the kings, for they said, "He is a leper." Then Jotham his son reigned in his place. Above it stood seraphim; each one had six wings: with two he covered his face, with two he covered his feet, and with two he flew. And one cried to another and said: "Holy, holy, holy is the LORD of hosts; The whole earth is full of His glory!" THIS KING, THE LORD OF HOSTS, IS JESUS CHRIST!